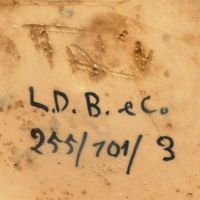 Their marks are also found on manufacturer-marked items, which would leave the minor possibility of a decoration studio. 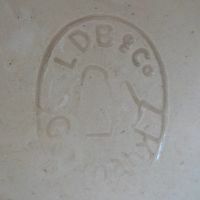 But first of all, there is no difference between items with or without an L.D.B.& Co. mark, and if the L.D.B.& Co. mark is present, it is often found in combination with a known decoration studio mark. 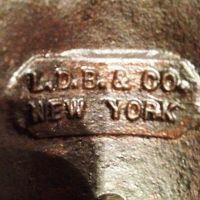 Hence L.D.B.& Co. was definitely not a manufacturer or decoration studio. The mark development from 'BAVARIA' over 'BAVARIAN CHINA', 'ROYAL BAVARIA' to 'PRINCE REGENT', and then to the stand-alone 'PRINCE REGENT' mark should be more or less obvious. The last version is (at least for me) peculiar; the use of leading and trailing double quotation marks is one thing but they are also used in what people may call 'publishing style': the leading ones are positioned as lower set, the trailing ones as high set (and are used following a period). Nobody in Germany would use them that way to enclose a name; I assume it's some weird French idea. The second bump in the ride comes from the apostrophe or whatever in "PRINC'E" which does not make any sense at all. 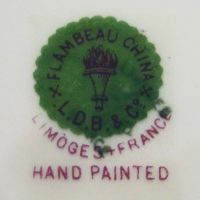 Next to the typical 'PRINCE REGENT' marks, the most common rendition is the Flambeau China torch mark which includes 'LDBC' and is often found in combination with the star mark used by the successor of Coiffe & Laviolette. 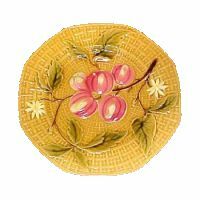 The remaining Laviolette business was the last to use this dark green star-shaped mark and these items were then handled by Flambeau China. I say 'handled' as the Flambeau business model evades me, it appears that they never really produced anything themselves but were merely (as some sources indicate) an export and trading company, claimed to have been operational between the 1890s and 1914. 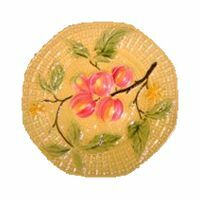 Which lets me believe that Flambeau China was either the name of the French L.D.B.&Co. subsidiary -or- a mere trademark used by L.D.B.&Co.. 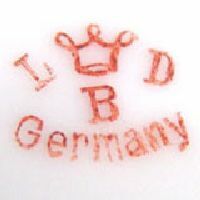 Plain 'L D B' with a crown over 'GERMANY'. Round 'L.D.B. & CO.' mark stating 'CZECHOSLOVAKIA'. Round 'L.D.B. 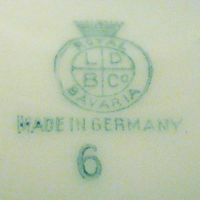 & CO.' mark stating 'BAVARIA', above 'MADE IN GERMANY'. 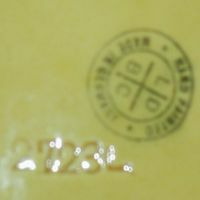 First mark used on items by the ⇒Porzellanfabrik Moschendorf. Round 'L.D.B. 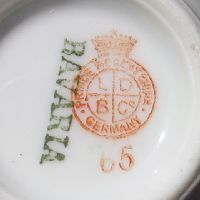 & CO.' mark stating 'BAVARIAN CHINA', above 'MADE IN GERMANY'. Round 'L.D.B. 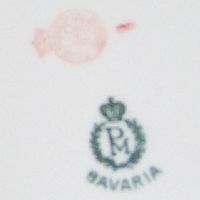 & CO.' mark stating 'ROYAL BAVARIA', above 'MADE IN GERMANY'. Crowned round 'L.D.B. & CO.' mark stating 'PRINCE REGENT CHINA' and 'GERMANY' (here with green Moschendorf mark. Clearer image of the crowned 'L.D.B. & CO., PRINCE REGENT CHINA, GERMANY' mark on another Moschendorf item. Another image of the crowned 'L.D.B. 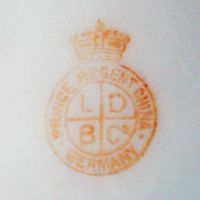 & CO., PRINCE REGENT CHINA, GERMANY'. 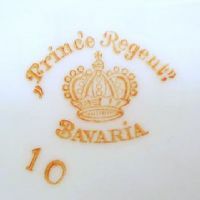 Standalone 'PRINCE REGENT BAVARIA' mark. 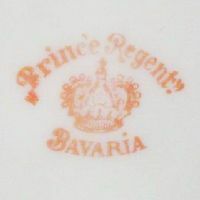 Another example of the 'PRINCE REGENT BAVARIA' mark. ... with the 'L.D.B. & CO'. 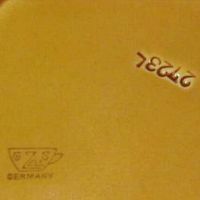 mark reading 'HAND PAINTED, MADE IN GERMANY' next to the impressed number '2723L'. 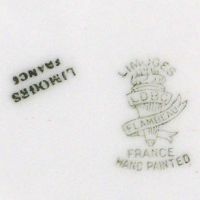 Cover-up mark showing 'FLAMBEAU CHINA' and 'L.D.B. 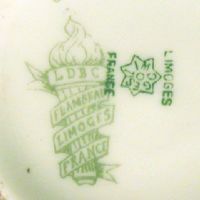 & Co.' above 'LIMOGES, FRANCE' and 'HAND PAINTED'. Impressed 'L.D.B. & Co.' above a hand holding a jug or beer stein above 'GERMANY'. 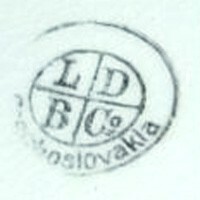 L.D.B. & Co. mark on a metal part of a lamp. 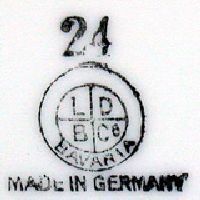 L.D.B. 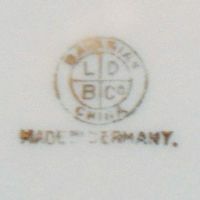 & Co. mark on an item with 'ITALY' scratched into the base.